What to Do After a Dog Bite Injury | Hupy and Abraham, S.C.
Dog bites can be very painful and can cause serious injuries and infections. It is important to take action quickly to make sure that your medical and legal recoveries are protected. However, it can be difficult to know what to do during such a scary time. Staying calm. Being attacked by an animal can be very scary. Many victims panic after being bitten, which only makes matters worse. It is important to stay level-headed and respond in a manner that will keep the situation under control. Getting immediate help. If the bite is severe, call 911 and let the paramedics handle it. If it is minor, clean it and seek prompt medical attention. Gathering information. Get the names and addresses of witnesses, the dog owner, and the people who had custody of the dog when it bit you. This information will be beneficial to you as you build a case. Also be sure to take pictures of the injury. Reporting the incident. 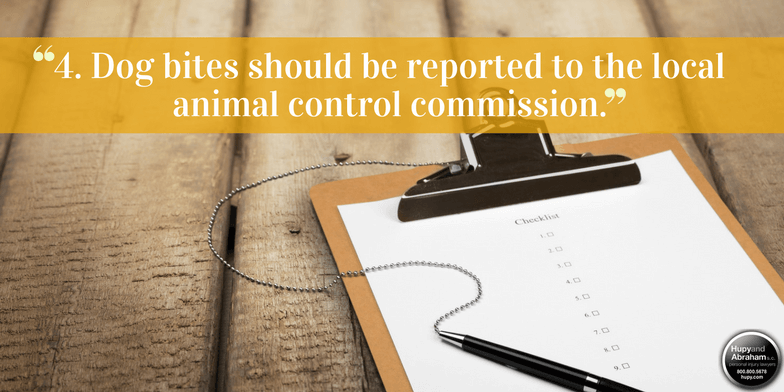 Dog bites should be reported to the local animal control commission. Following doctors’ orders. After you get emergency medical attention, it is equally as important to keep all follow-up medical appointments and to follow the treatment advice of your doctors. Getting legal representation. If a dog has bitten you, you may be entitled to compensation. However, you will have to take action in order to settle your case or to make a fair recovery in court. The time for you to take action is now. You can find more tips and resources for protecting your dog bite recovery on our website, and you may contact us anytime for a free and confidential consultation.